Gaodetec is one of the leading grouting machine manufacturers in China. Gaodetec high-speed grouting slurry mixer is a high shear mixer, mixing the slurry time takes about 2 minutes. So the water slurry blender can quickly mix, grouting cement and additives, such as high speed high shear mixer can also use the blender, agitator has two functions, one is to avoid sediment, another is the mixed slurry storage.In this case, the mixed continuous work can be done. 1. What’s the W/C ratio of mixing slurry? 2. What’s the capacity do you want in one hour? 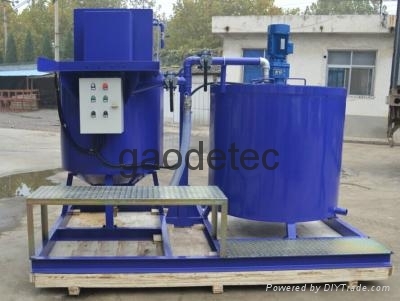 How to find one good high shear high speed grout mixer supplier in China, send email to info@gaodetec.com or call or send message through whatsapp viber wechat etc. to +86-15903613994.